Four BYU professors joined a panel discussing International Cinema’s showing of the Turkish-French film Mustang. dle Eastern Studies libr. ); Daryl Lee (French and Italian) and Brandie Siegfried (English), to lead a panel discussion on the film. 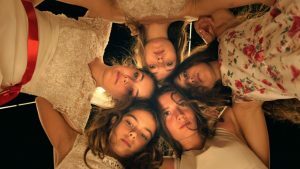 In the film, sisters Sonay, Selma, Ece, Nur and Lale are orphans raised by their grandmother and uncle. After getting caught playing a game in the ocean with boys after their last day of school before vacation, they are locked inside the house, cut off from the outside world. They are taught by the older neighbor women to cook and keep house as preparation for their future as wives. One of the main themes of the film is the control that the girls’ family members, particularly their uncle, exercise over their lives throughout the film. First, their electronics and makeup are taken away, then they are taken to the doctor for a “virginity test” to ensure their suitability for marriage. They are made to wear ultra-conservative clothing and forbidden from going to school. They are only let out on rare occasions, one of which is a trip to town to “get lemonade,” but really to show the girls off and attract potential suitors. Augustine-Adams commented, “Historically, there is a tradition for cultures to reduce women to their bodies and to their biological functions.” Ergüven’s film questions this cultural tradition in view of the rights and health of the women and girls affected. Siegfried said, “Little by little [throughout the film] you can watch the joy seep away. But the [the film] opens that possibility. . . that the humanity of men and women, when it’s allowed to flourish, can build that beauty back again.” Augustine-Adams concurred, adding that we all have the responsibility to help that beauty flourish. Olivia covers events for the International Cinema for the Department of Humanities. She is a senior pursuing a degree in French language with a minor in writing and rhetoric.